Spring in London is a wonderful thing. As people start coming out of hibernation, our calendars fill up with all kinds of unmissable events for 2019 (check out Kew’s Orchids Festival for another flower fix), and the parks and trees burst into life with all manner of pretty petals. We might be in a sprawling capital city, but doesn’t mean there aren’t amazing green spaces to enjoy these pops of colour. 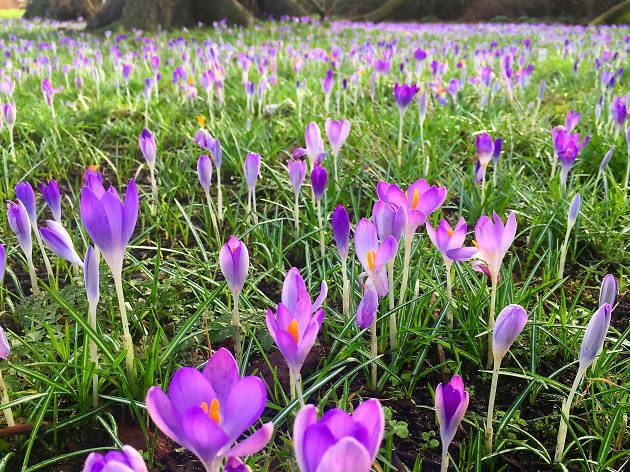 Time to leave behind those cosy pub fires for another year, and visit London’s best parks to soak up some natural beauty. 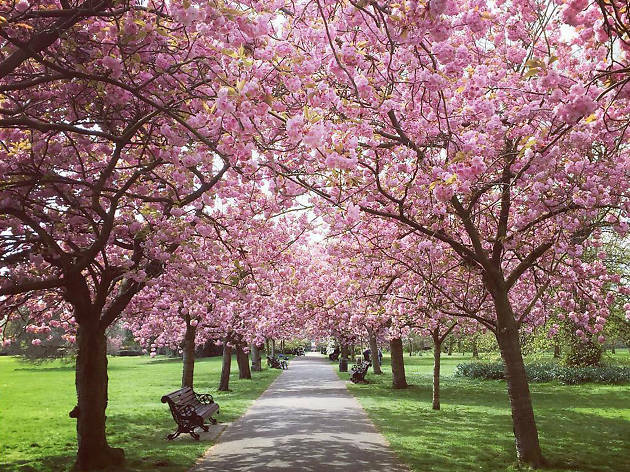 From bright pink cherry blossoms to seas of lavender later in the year, take a look at our list of the best places to see spring flowers in London. Where? 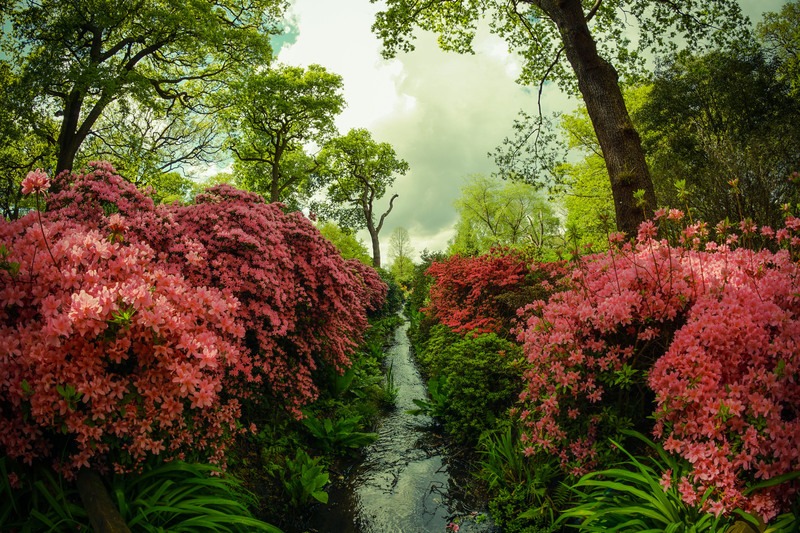 Chiswick House, Kenwood Garden, Isabella Plantation (Richmond Park). 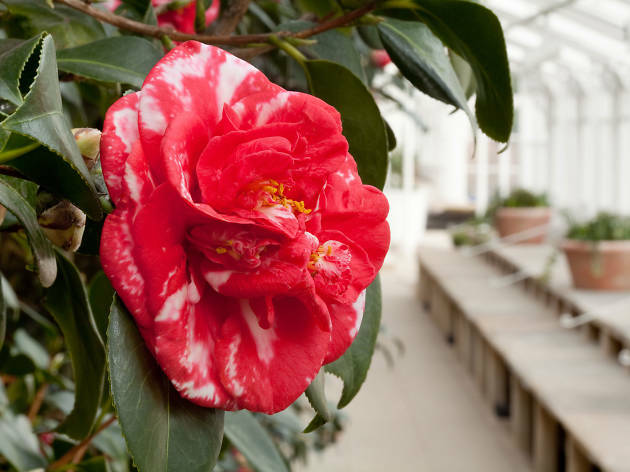 Flowery fact Chiswick House is home to one of the world’s rarest varieties of camellias, the deep pink ‘Middlemist’s Red’. It was brought back from China in 1804 by Londoner John Middlemist and the only other known plant of this kind is in Waitangi, New Zealand. Hopping on a train to west London doesn’t seem like quite so much of a trek now, does it? Where? Greenwich Park, St Paul’s Cathedral, Kew Gardens. 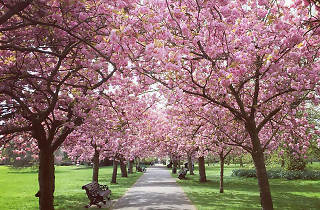 Flowery fact In Japan, cherry blossom is thought of as the unofficial national flower. They call it ‘sakura’, which is also the word for ‘raw horsemeat’. No prizes for guessing which will get you more likes on Instagram. Where? 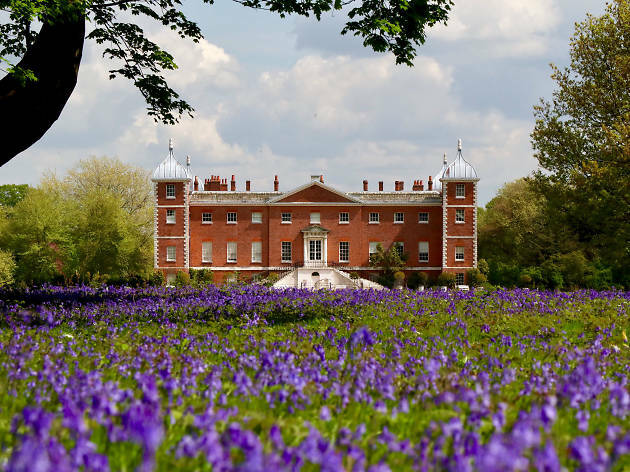 Osterley Park (Hounslow), Highgate Wood, Wanstead Flats. Flowery fact Bluebells are a protected species, so don’t be tempted to pick them and take them home. What would Sir David Attenborough think? Where? Green Park, Hampton Court Palace, St James’s Park. 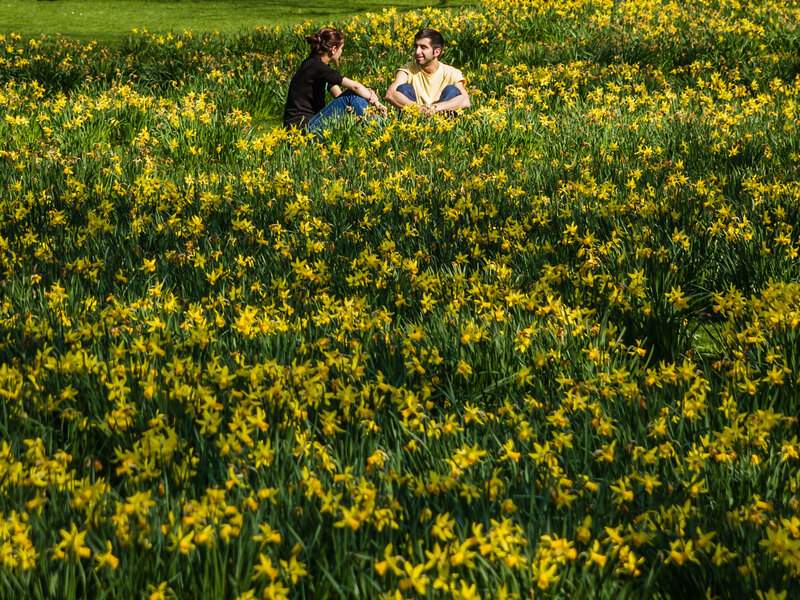 Flowery fact Green Park is a sea of yellow in spring, with 1 million daffodils in bloom – but that’s the only time you’ll see flowers there. 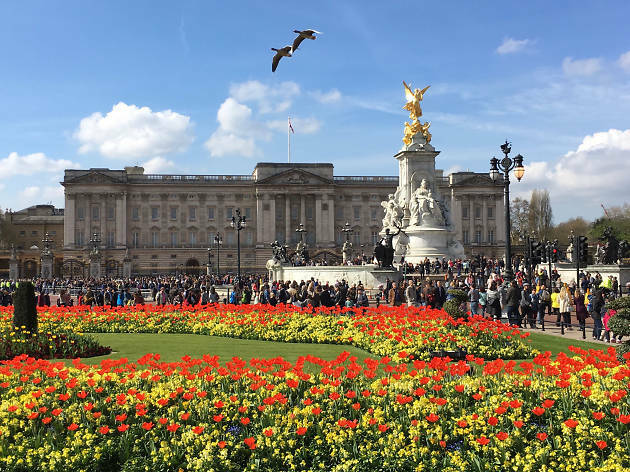 The park has no formal flower beds – rumour has it that’s because King Charles II’s wife had them removed after she caught him picking flowers there for another woman. Busted. Where? Kew Gardens, Cannizaro Park (Wimbledon), Battersea Park. 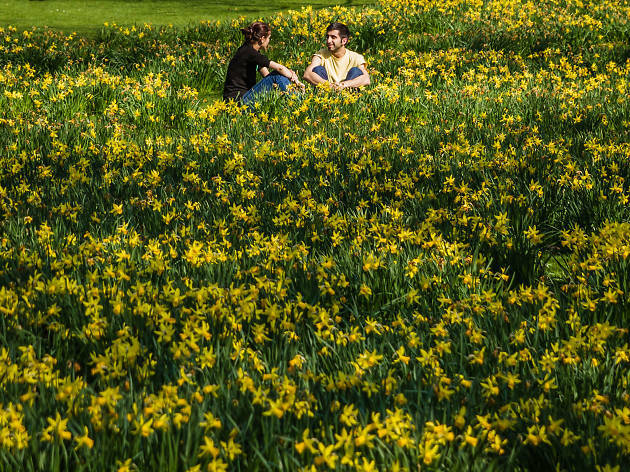 Flowery fact Kew’s impressive ‘crocus carpet’ makes up just part of the whopping 5 million bulbs planted in the gardens. In total, it’s the biggest spring flower display in the country. Who needs the countryside? Where? Peckham Rye Park, Hampstead Heath Pergola, Holland Park. Flowery fact Built in the 1900s, the Hampstead Heath Pergola is as long as 1 Canada Square at Canary Wharf is tall. 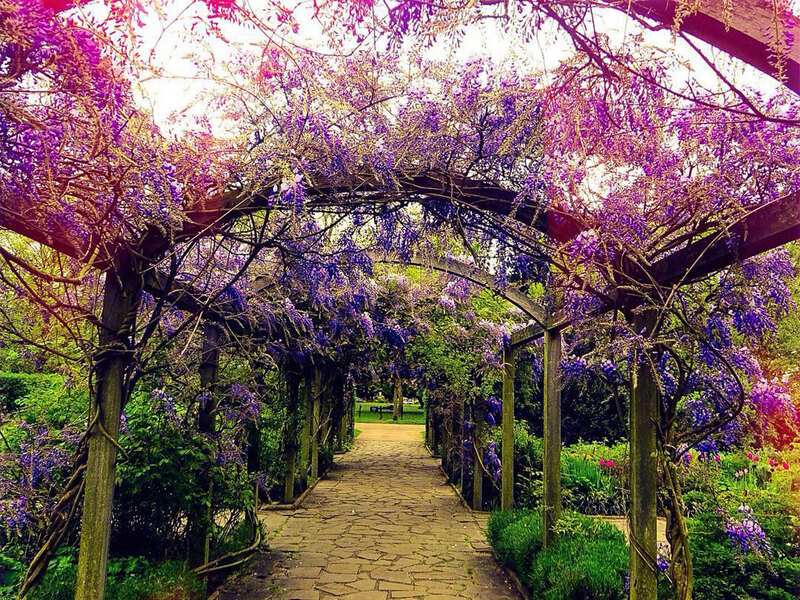 In spring, it’s even more impressive, as it gets covered with Parma Violet-coloured, sweet-smelling wisteria. Cop a whiff of that! Where? 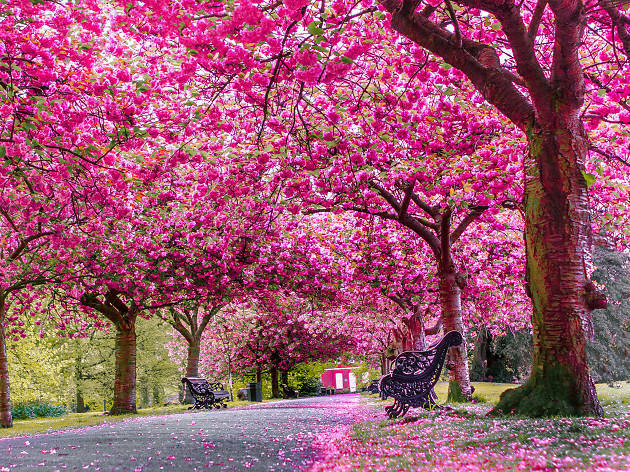 Buckingham Palace Memorial Gardens, Regent’s Park, Kensington Gardens. 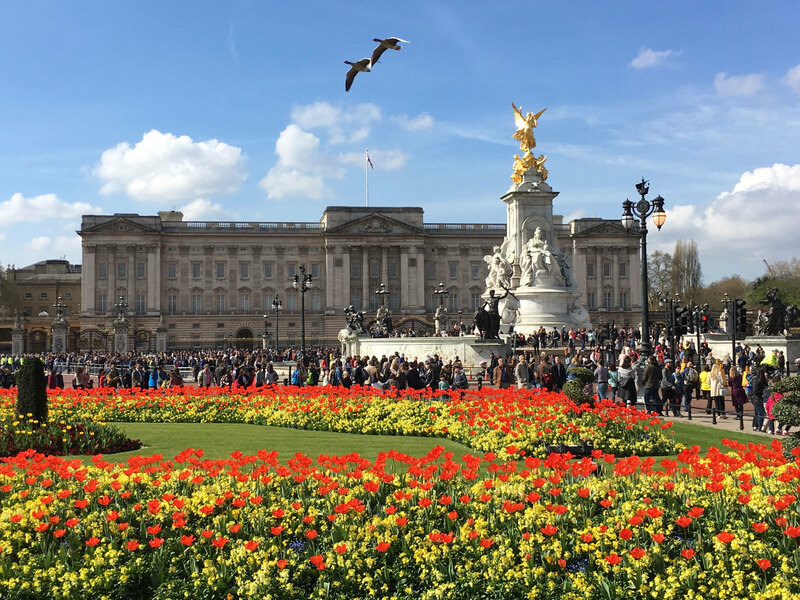 Flowery fact Created in honour of Queen Victoria, the Memorial Garden outside Buckingham Palace is filled with around 50,000 yellow wallflowers and red tulips. Replanting takes up to ten staff around two weeks. That’s a lot of bad backs. Where? 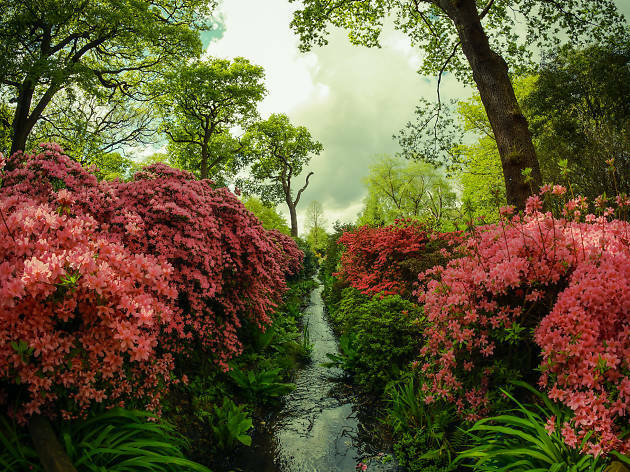 Isabella Plantation, Kenwood House. 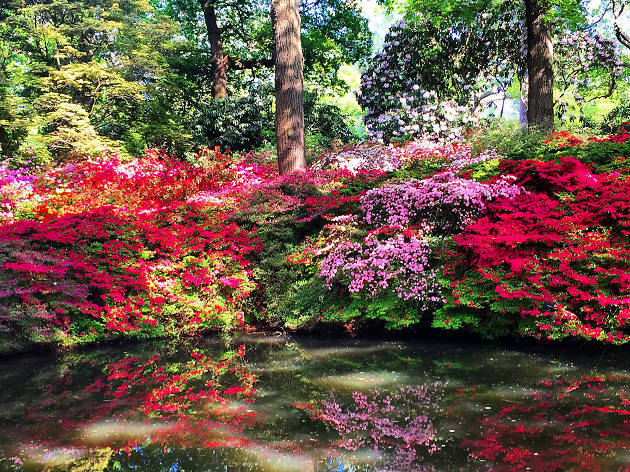 Flowery fact Hidden away in Richmond Park, Isabella Plantation is home to 100 different varieties of azaleas – but it hasn’t always been a flowery haven. Back in the seventeenth century, it was known as The Sleyt, which meant ‘boggy ground’. Doesn’t sound quite as aesthetically delightful. Where? 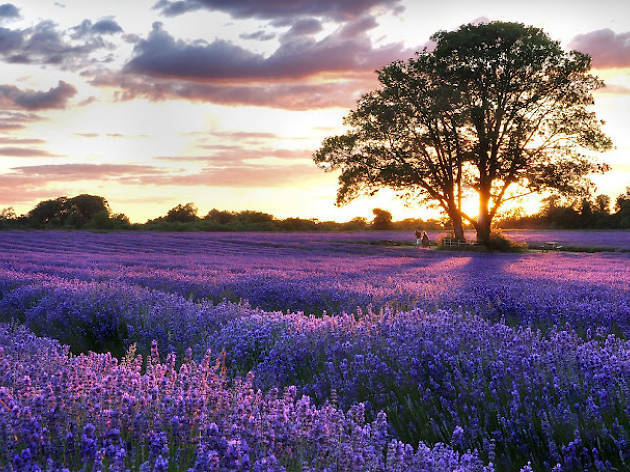 Mayfield Lavender Farm (north Surrey), Vauxhall Park, Kennington Park. Flowery fact You might associate lavender with sunny Provence, but you don’t need to cross the Channel to see rolling, perfumed fields of the stuff. 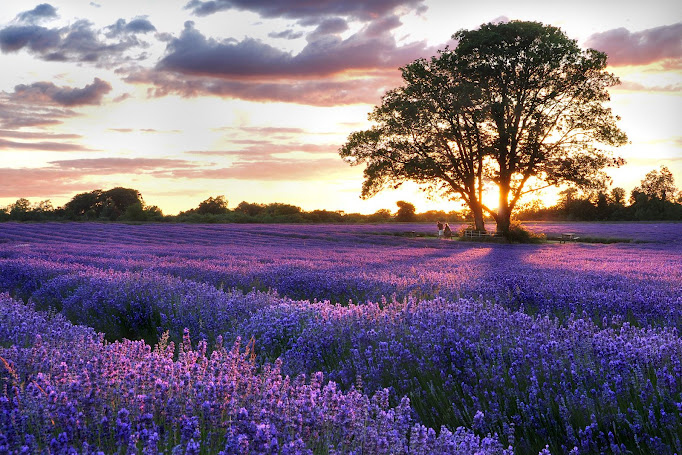 Mayfield Lavender planted its gorgeous purple fields in 2010 to revive the historic lavender industry, which boomed here in the eighteenth and nineteenth centuries. Entry costs just £2 per adult. Close your eyes and you might almost feel like you’re in France. Almost.